The modern work environment is defined by its growing internationalization – especially when it comes to project based work. People from all over the world collaborate on a joint project like international roll-outs and development. With team members located in different countries and time zones, it seems like the traditional concept of team leadership is no longer valid for a major part of business undertakings. Here’s a guide to virtual collaboration and tips for being successful with geographically distributed teams. As a team leader of virtual teams you need very similar skills and abilities needed for managing conventional teams there are, however, some key differences. Virtual teams don’t have many opportunities for face-to-face interaction. 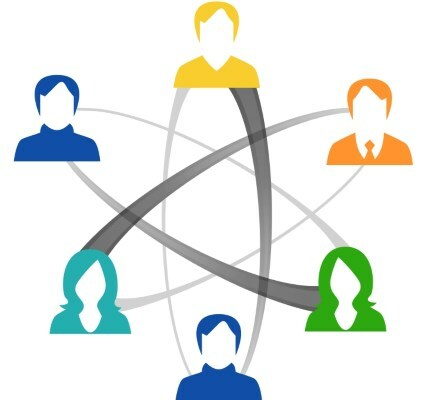 As one of the major differences this is also considered one of the biggest challenges in virtual collaboration. It certainly makes successful teambuilding more difficult than in traditional team settings. How can you develop a good relationship with your team members and build strong ties among the team members without personal face-time? When casual water cooler chats aren’t an option, the team leader should make an effort to create space for informal conversation. Encourage your team to have virtual lunches on a regular basis to build rapport. Having a small talk session at the beginning or the end of a video conference is always considered good business practice but it is essential for good teamwork and working morale in virtual teams. A project’s kick-off-meeting is a great event for all the team members to get together and establish stronger team ties. Diversity is a constant factor in teamwork, cultural diversity is an especially prominent factor in geographically distributed teams. Team members from different countries bring their fascinating cultural variety to the team. Cultural differences can be challenging and might lead to misunderstandings among the team members. Knowing about the differences and how they influence the team members’ work style is essential for successful virtual collaboration. As the team lead, it is advisable to communicate potential differences in a virtual workshop and make them understood in the early phase of the project. If everyone on the team learns to appreciate their teammates’ differences, the team might actually benefit from them. Communication is crucial when it comes to leading a virtual team. Make sure that you make the best use of the technology available for virtual teams like video conferencing, online chats and your project software’s communication features in addition to one-on-one conversation. It is important to have an open ear for your team members’ concerns: Give them the chance to regularly address the difficulties they are currently facing. Keep in mind that most often, the less obvious differences are causing misunderstandings such as differing e-mail communication styles or juxtaposed concepts of time. While one team member is used to compose very concise to the point e-mail messages the recipient might consider them impolite because they lack small talk. When it comes to virtual team settings, you want to establish a clearly structured and very transparent system of standards. This includes clear definition of each team member’s responsibilities and role. It is important that as a team leader you make reporting principles, task management and problem solving procedures as transparent as possible. Especially with distributed teams, where you can’t just walk into the office next door or the adjacent building, having standardized processes is a strong foundation for virtual collaboration. Even if every team member individually is doing a fantastic job, their contributions to the project might not add up and eventually might not result in a successful project delivery. Do Virtual Team Players Need to Bring Special Qualifications? Selecting the right people to collaborate in a virtual setting is crucial for the team’s success – and ultimately for the project’s successful delivery. Virtual team members should have a strong cultural understanding. The best virtual team members are those who thrive in interdependent work relationships, are self-reliant and self-motivated. Virtual teams are most efficient if their members are independent thinkers who are willing to take initiative. International work experience can help to settle in the global flow of work more quickly. Even though working in a virtual setting reduces the need for business travel, it requires a high degree of flexibility to accommodate the need for meetings outside of regular business hours due to different time zones. Successfully Leading Virtual Teams - InLoox • Copyright 1999-2019 © InLoox, Inc. All rights reserved.